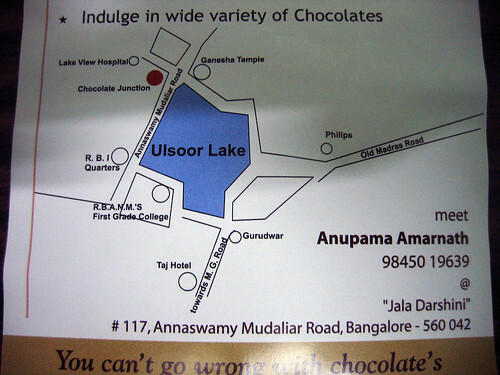 Where to Eat Delicious Alphonso Mango Icecream in Bangalore? How to Get 2GB of Online Backup for Free? Sign-up here for a free and secure 2 gigabyte online backup account. No setup fee, no credit cards, no monthly payments, no expiration! This awesome service is brought to you by mozy online backup. For every person who clicks on that link and starts using Mozy*, we’ll both get another 256MB of free backup space. That’s right, I get extra space, and so do you. That’s 1GB of free space for every four people! For a limited time, there is no limit on the free space you can get. * You will be credited with your free space when the user actually performs a backup with Mozy. And, if you navigate away from that link, you can enter the referral code 6B98S2 during the registration process. This useful piece of information landed in my inbox today. It is summer time and March-April is the season for diseases like chickenpox. It is a highly contagious disease and can spread rapidly specially in closed spaces. Please find attached some information on chickenpox, its vaccine and Herpes Zoster which is also caused by the same virus so that you can take adequate precautions. Download the chickenpox knowledge base. Artistes’ Repertory Theatre presents Yayati by Girish Karnad. This production premiered the playwright’s own translation, at the opening of Kannada Rangabhoomi-Namaskara on October 24 2006, at Ravindra Kalakshetra. A powerful script with a powerful cast! Raza Hussain, last seen in his highly acclaimed performance as Tipu Sultan in ART’s popular production of The Dreams of Tipu Sultan, plays Yayati. Sukhita Aiyar plays Sharmishtha with Veena Appiah as Devayani, Kartik Kumar as Pooru, Mythri Surendra as Swarnalata and Anjalika Kapur as Chitralekha. Directed by Arundhati Raja; Set & Lighting design by M. S. Sathyu; Costumes by Jayanthi; Music by Sankarshan Kini also on Tabla and vocal by Dipti Rao. 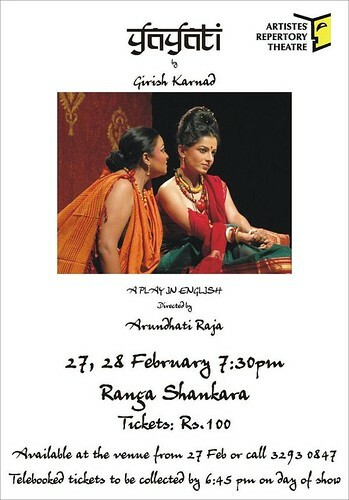 27 & 28 February at the Ranga Shankara. BarCamp is an unconference – organized by attendees, for attendees. It’s an open, welcoming event for geeks to hang out with or without wifi and smash their brains together. It’s about geekery and having a focal point for great ideas. I’ll be in Bangalore, but am undecided about my schedule and hence about my presence at this camp. Here’s a pretty useful world time zone map. World Time Zone Chart (PDF). My friend SriVidya had sent me a few cooking recipes. While I can’t try any of these at home – I have been banned from entering the kitchen after I managed to set a brand-new pressure cooker on fire trying to make popcorn (hey, I followed instructions on the cover to the dot) – maybe you can give them a shot. And don’t forget to invite me! Check your site’s strength at seomoz.org. And how is the score calculated? According to the website, the tool estimates using criteria from humans (del.icio.us tags, Alexa Rank, mentions at Wikipedia, etc.) and machine-assembled data (like pages indexed, internal link percent and even PageRank itself). It is by no means perfect or entirely accurate, but it is a significant upgrade from Google’s often inaccurate and infrequently updated PageRank score (and it’s fun to use). And how does the GEO blog fare? PAGE STRENGTH: 2.5 / 10 – Although not a considerable presence, your site/page is making inroads online. Visitor traffic and search engine visibility is within your grasp. I have constantly been on the lookout for a quick and painless way to host Microsoft PowerPoint presentations. I have found a “quick and painless” solution in slideshare (slideshare.net). slideshare let’s you embed embed a presentation on your blog (like I have done below) or share it as a standalone link. Tagging lets you discover other interesting presentations and lets others discover yours. There are some pretty interesting presentations hosted on the site. The site’s interface is clean, but it’s not intuitive – at least the first time you use it. You need to look around a bit to figure out what to do. I know, I said it’s quick and painless and it certainly is, but only from the second usage (when you already know how the interface works). There’s no auto-browse feature to move from one slide to the next; you need to manually browse through the slides. But is that a useful feature to have? Most auto-browse systems are either too fast or too slow and only end up causing user frustration. There is a full-screen option to make the viewing easy on your eyes. Here’s a sample embedded-in-your-blog presentation from my Business Law course. It’s prudent to have a quick glance so that you know more about how the banking system works. I wrote too soon! It’s a good idea to get your facts right before you blog. The full-screen option is available only through the standalone link. It’s NOT available through the embedded object. To see this feature in action, check out Bankers & Customers + Dishonor of Cheques. 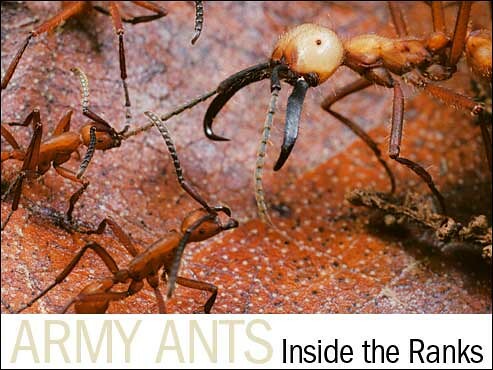 Catch a preview on National Geographic. Having heard a fair amount of negative reviews about Kabhi Alvida Na Kehna, I decided to check it out for myself today evening. A mid-term Cost Accounting exam in the afternoon made the movie all the more desirable. Off we went, Vinayak, Darshan, and myself. We were just in time (or perhaps, as a management student I should say JIT) to catch the 18:25 show. Kabhi Alvida Na Kehna is a movie on an awkward subject – marriages that turn sour and what happens when such a married person falls in love with someone else’s wife. It’s a bold theme and is sure to draw mixed reactions from an audience. The plot is laid out well right up to the end. However, I failed to understand the significance of shooting the movie abroad. Why not shoot in India? That said, the acting is highly commendable. It’s not easy to act convincingly in such a movie where emotions needs to appear genuine. I particularly liked Rani Mukherjee’s performance. You tend to somehow connect with her in the movie. The songs are quite decent as well. This movie is a MUST see. If you already have, I would love to hear your thoughts. The pesticide-in-your-soft-drink war continues with The Centre for Science & Environment’s latest study (covering 12 states), which has found dangerous levels of pesticides in all samples of soft drinks tested. Read the complete story – CSE releases new study on pesticides in soft drinks. Be an informed individual. Would you still drink your colas? ICICIDirect invites you for a session on Basics of Commodities on Friday, August 04, 2006 from 6.00 PM to 8.00 PM or on Saturday, August 05, 2006 from 11.00 AM to 1.00 PM. Treatments available for termites, rats, lizards, spiders, red ants etc. Here’s something that you, as a customer of the banking industry, SHOULD read – The Code of Bank’s Commitment to Customers. Let me know if you have any problems downloading the file and I’ll email it to you. Here’s a useless strategy from HSBC to get you to spend your hard earned money. Did you know that if you make purchases of Rs. 2500 or more using your HSBC debit card between April 15, 2006 and May 31, 2006 you will get a priceless Rs. 51 as cash back? That’s an amazing 2.04% ROP! Yeah, that’s a new term coined by me. It stands for Return on Purchases. Now, before you run out with your HSBC debit card to make that mega-purchase worth Rs.2500, just remember that this offer is applicable only to those debit cardholders to whom HSBC has sent a mailer. How to earn well from the comfort of your home? Do you want to be a teacher without going to school? Here is a chance to stay at home in any part of the country, teach, and get paid handsomely. Bangalore based Tutor Vista has introduced online tutoring for children in the US and the UK. All that the tutor needs is a computer connected to a UPS, a broadband connection, a headset, and a digital pen. Tutors are required to be post-graduates or graduates with a B.Ed. degree. The company trains them for 40 hours over a period of two weeks and certifies them after a test. There are no charges for the training and certification. Tutors can work part-time or full-time. Part-time means a minimum commitment of 10 hours a week and full-time tutors are those who put in 45 hours a week. The hours are pre-scheduled and committed. With prior notice, you can change the timings, subject to feasibility. For example, if you commit to 6 PM to 8 PM Eastern Standard Time in the US for six days a week, you need to be available during those hours on a regular basis. The sessions are half an hour each and are usually in the evening or at night. The remuneration is anywhere between INR 8000 to INR 14000 a month. Tutoring is offered for students across all classes and also for specialized test preparations like SAT, GMAT, GRE and the state exit exams. If you are interested, then send your resumes to careers@tutorvista.com. Visit http://www.tutorvista.com/careers for details. This post is specially for readers who live in or near to Banashankari 2nd Stage. Green Trends is a new beauty saloon that’s opened shop near the BDA Shopping Complex and which offers beauty care services using nature-based products (herbs, fruits, et al.) It’s a unisex saloon, but there are “separate private areas” for ladies and gents. Yeah, that’s what the flyer says. The flyer also says that towels are “sanitized everyday” to ensure 100% hygiene. Does this imply that on a given day everybody except the first person has to use unsanitized towels? I would definitely not want to be the last customer for the day. Shouldn’t that read “sanitized after every use”? It also says that aprons are cleaned and disinfected thoroughly before every use. Let me know if you’re brave enough to step inside.